It wasn’t until I had the most candid conversation with my Dad that I realized I was fighting a losing war until I let go of ALL of my fears, let the truth come out and let the chips fall where they may. The outcome is that I have an even better relationship with my dad, I feel free and I haven’t felt this carefree in my entire life. Friday night was pretty awesome…C-Pants and I did some grocery shopping, I ordered my first Chinese food dinner in the city (Hey, I have been very good all week) and watched Lock, Stock and Two Smoking Barrels with a deprived boy who’d never seen that movie before. Saturday, I woke up super early (even though I didn’t get much sleep Friday night) and drove to MD to meet with the gang to watch The Hangover. I’ve been waiting for this movie to come out for MONTHS! It was better than I expected, and Zach Galifianakis may just be my new hero. Pumpernickel wrote an awesome review of it, which was quoted in the Express BlogLog. After the movie, we walked around the lake and chatted for a bit. Around 3, I headed back to DC to get ready to drive out to VA to finally spend time with the bestie in her element and meet my ‘extended family’. Nirmal came out too, which was awesome because my best friend of 10 years met my best friend of 4 years. The result? A lot of hating on me and a lot of That’s What She Said moments…When I told them about my Starbucks order, Nirmal asked me why the 6 pumps of white mocha…When I explained that the usual drink has 5 pumps in it, he said “It’s the extra pump that goes a long way!” to which I replied with “That’s what SHE said…” and that was only one of the moments from the entire night. You’re damn right if you guessed that I used that sucker on my way back to the city. Sunday morning, I woke up to find the roomies (minus Tim) on the couch watching Law & Order…and joined them till about 12 when I finally decided to just head home and deal with whatever it was coming my way. *See beginning of blog* I got home to find ALL the roomies at home and it was the first night we all spent the night together because everyone is finally moved in. We watched How to Make Friends & Alienate People, drank beer in the back while talking about dreams, sleep walking, deja vu and high school memories. Came back inside to watch the movie again and all 7 of us (roomies plus 2 guests) sat on the couch and had one of the greatest nights of my life. I couldn’t be happier. DC…you better be ready for me. Of course, what made the weekend even more amazing was the text messages…starting Saturday morning and keeping me smiling all weekend. Discoveries of the weekend: Mike’s Hard Lemonade (Cranberry and Pomegranate are the best. ), How awesome a GPS is, the joy of being free, how incredible my best friend really is, the feeling of having a constant smile on my face, & that I’m a cuddler when sharing a bed. I now bring you the greatest super star in the history of super stars…Watch this, worship her and never ever stop reading her blog. Glad you liked The Hangover. I can’t wait to see it. Oh yeah…the Hangover was so worth the drive to MD at 10 on a Saturday morning! This makes me smile pn a Monday morning. You…a cuddler? Who’da thunk it? 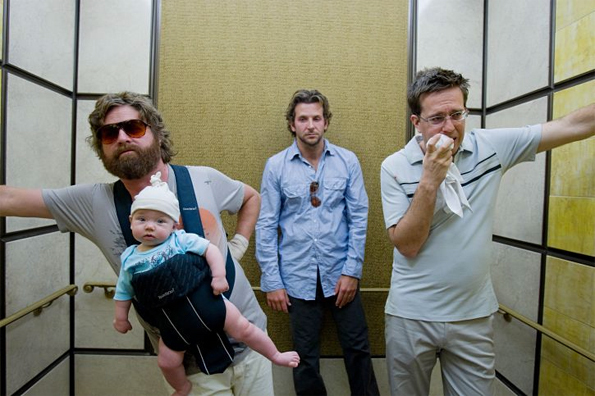 The Hangover was awesome!!! Zach is the man. In fact, I hope my beard grows up as solid as his! I know right? He was classic. I’m so glad you’re having fun! You really deserve it! On a limb with Claudia’s last blog post..Right. I’m so glad you had a great weekend!!!!!!!!!!!! And to hear that you and your dad are doing better is AWESOME. I’ve been worried about you since last week, so it’s such a relief to hear that you’re doing better. I love you soooooooo much, Princess. I really am really relieved…It was the hardest conversation but once we were done, I was so…free. Hard stuff only seems hard at first. Then afterwards you’re all like “wtf was I so worried about? !” and all is good. Mikes? Babygirl, you are not 16. Step away from the sugar alcohol…it will only result in stomach aches and vomit. I’ve never had a Mike’s. But I won’t judge. Because I’ve drank things I won’t even admit to on a blog. Glad you liked The Hangover. Zach Galifianakis = amazing! I seriously need to find someone to see The Hangover with, ASAP. Ha.